"This cloud is very spectacular, though the evaporation rate does not threaten the planet right now," explains David Ehrenreich of the Observatory of the University of Geneva in Switzerland. "But we know that in the past, the star, which is a faint red dwarf, was more active. This means that the planet evaporated faster during its first billion years of existence because of the strong radiation from the young star. Overall, we estimate that it may have lost up to 10 percent of its atmosphere over the past several billion years." 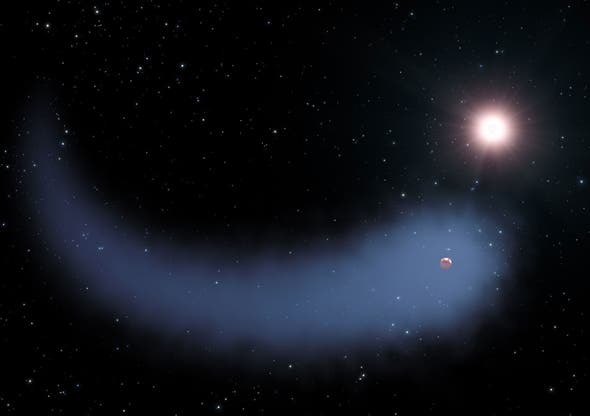 Astronomers using NASA's Hubble Space Telescope have discovered an immense cloud of hydrogen dubbed "The Behemoth" bleeding from a planet orbiting a nearby star. The enormous, comet-like feature is about 50 times the size of the parent star. The hydrogen is evaporating from a warm, Neptune-sized planet, due to extreme radiation from the star. The planet, named GJ 436b, is considered to be a "Warm Neptune," because of its size and because it is much closer to its star than Neptune is to our sun. Although it is in no danger of having its atmosphere completely evaporated and stripped down to a rocky core, this planet could explain the existence of so-called Hot Super-Earths that are very close to their stars. These hot, rocky worlds were discovered by the Convection Rotation and Planetary Transits (CoRoT) and NASA's Kepler space telescope. Hot Super-Earths could be the remnants of more massive planets that completely lost their thick, gaseous atmospheres to the same type of evaporation. Because the Earth's atmosphere blocks most ultraviolet light, astronomers needed a space telescope with Hubble's ultraviolet capability and exquisite precision to find "The Behemoth." "You would have to have Hubble's eyes," says Ehrenreich. "You would not see it in visible wavelengths. But when you turn the ultraviolet eye of Hubble onto the system, it's really kind of a transformation, because the planet turns into a monstrous thing." Because the planet's orbit is tilted nearly edge-on to our view from Earth, the planet can be seen passing in front of its star. Astronomers also saw the star eclipsed by "The Behemoth" hydrogen cloud around the planet. Ehrenreich and his team think that such a huge cloud of gas can exist around this planet because the cloud is not rapidly heated and swept away by the radiation pressure from the relatively cool red dwarf star. This allows the cloud to stick around for a longer time. The team's findings will be published in the June 25 edition of the journal Nature. Evaporation such as this may have happened in the earlier stages of our own solar system, when the Earth had a hydrogen-rich atmosphere that dissipated over 100 to 500 million years. If so, the Earth may previously have sported a comet-like tail. GJ 436b resides very close to its star – less than 2 million miles — and whips around it in just 2.6 Earth days. In comparison, the Earth is 93 million miles from our sun and orbits it every 365.24 days. This exoplanet is at least 6 billion years old, and may even be twice that age. It has a mass of around 23 Earths. At just 30 light-years from Earth, it's one of the closest known extrasolar planets. Finding "The Behemoth" could be a game-changer for characterizing atmospheres of the whole population of Neptune-sized planets and Super-Earths in ultraviolet observations. In the coming years, Ehrenreich expects that astronomers will find thousands of this kind of planet. The ultraviolet technique used in this study also may also spot the signature of oceans evaporating on smaller, more Earth-like planets. It will be extremely challenging for astronomers to directly see water vapor on those worlds, because it's too low in the atmosphere and shielded from telescopes. However, when water molecules are broken by the stellar radiation into hydrogen and oxygen, the relatively light hydrogen atoms can escape the planet. If scientists spot this hydrogen evaporating from a planet that is slightly more temperate and less massive than GJ 436b, it could be an indication of an ocean on the surface.